This is for my friends on 135th street. This theater was the Claremont Theater. 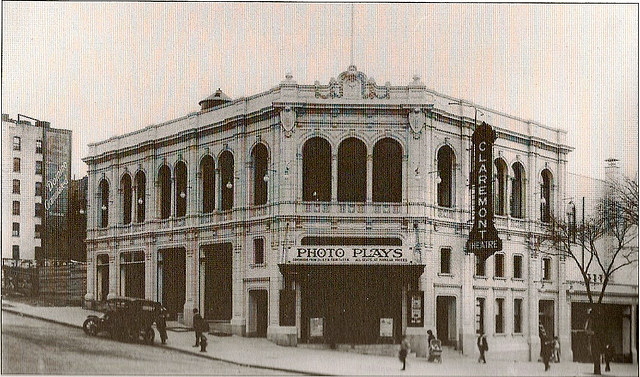 With 1350 seats it opened in 1914. It was built for movies only, no vaudeville. It was designed by apartment building architect Gaetan Ajello, this was a departure from his usual line of work. 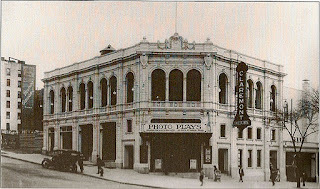 The theater was gutted after 1933 when it became a automobile showroom. The space was used as a roller rink, dance hall and ballroom. It is now a "Tuck-away" storage facility. The White terra cotta front with it's motion picture camera at the top has been Landmarked by the city. There was a Wurlitzer organ installation done just prior to opening and then it was repossessed by Wurlitzer in 1916. That organ was eventually shipped to a theater in Chicago and is now in a seminary somewhere in Illinois and is still playable.